Robert Coburn of the Conservatory of Music, University of the Pacific, 3601 Pacific Avenue, Stockton, CA U.S.A.
"With Music Beyond Performance: SoundImageSound ... the Conservatory Computer Studio for Music Composition (CCSMC) in combination with the Conservatory of Music, University of the Pacific presents concerts featuring the work of artists who cross boundaries to combine the aural and the visual. 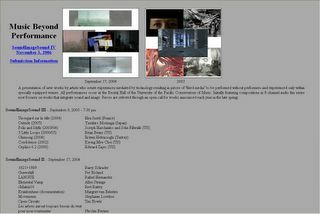 For 2006 this event will again feature new works of "fixed media" which in some manner combine multi-channel sound and visual images without "live" performance. " Domotic - Beautiful song "There may be a tiger"